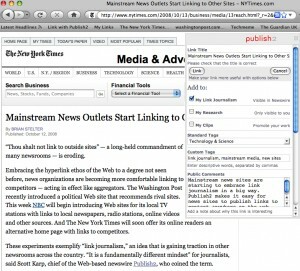 Publish2 is designed for journalists and newsrooms to save links to interesting and relevant news from any source on the web, then publish those links on their sites using widgets (like the one in this blog’s sidebar) or feeds. 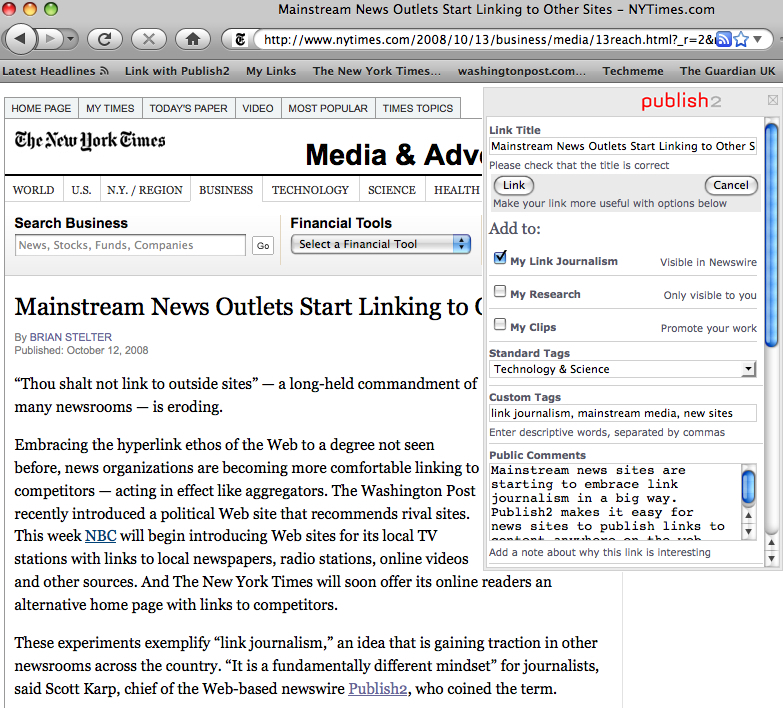 Our browser shortcut (AKA bookmarklet) makes it super easy to save those links — both for web-savvy journalists and those new to the web — and then we provide a lot of flexibility for what you can do with those links. Today, we’re adding a whole new dimension to Publish2 as a platform for link journalism — you can now use Publish2 to send links to other social networks, where you already have a following. Our first two connections are to Twitter and delicious. Twitter has become, for me, one of the most interesting sources of links — and a great place to share links. The problem is those links disappear into the Twittersphere — there’s no easy way to organize or reuse those links after they’ve been sent to Twitter. Now, with the new Publish2 Twitter connection, you can send a link to Twitter and at the same time save it to Publish2, tag it, and add it to a Publish2 link feed on your site. We’ve added a dedicated Twitter comment field, so you can write a longer comment on Publish2 and tailor a shorter comment for Twitter. 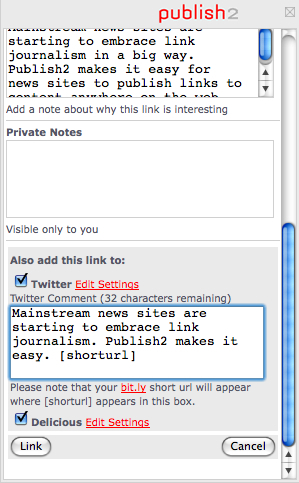 Or if you write a shorter Publish2 comment, that will get sent to Twitter automatically. We’re using bit.ly to automatically convert the URL you save on Publish2. And then at the bottom of the form, check the Twitter box. Add a Twitter comment if you want. Click “link” and you’re done. Steve now has these links saved in a useful form. He can add the link to a Publish2 Newsgroup for a collaborative linking effort. He can also find the link easily with the tags he added. The link also appears on his Publish2 profile, for anyone following his links there. Publish2’s Twitter connection is also a great way for newsrooms using Twitter to go beyond automatically feeding links to their content into their Twitter feeds — which is pretty impersonal and not how most individuals use Twitter. It’s also redundant to their RSS feeds. Instead, newsrooms could use their Twitter feeds to share interesting links. And there’s evidence that breaking out of the auto-feed approach to Twitter is actually the key to growing a Twitter following. This makes sense, since Twitter is about PEOPLE sharing things. You can automatically send all of your Publish2 links to delicious, or select which ones to send. It’s as easy as checking a box. With Publish2, publishing and distributing links no longer has to be a hassle. Twitter and delicious are just the first connections. Coming soon are Publish2 connections to Facebook, Google Reader, WordPress, Movable Type, and many more. Register for Publish2 and give it a try!